Susan Smith–Peter is associate professor of history at the College of Staten Island/City University of New York. She is the author ofImagining Russian Regions: Subnational Identity and Civil Society in Nineteenth-Century Russia (Leiden: Brill, 2018) and has published widely on regions and regionalism. Being instructed in the Russian language often feels like being inducted into a cult of Pushkin. Of course I mean Alexander Sergeevich Pushkin, Russia’s greatest poet. My Russian language teachers, particularly the Russian women, would lower their voices when speaking of him. We would have to memorize short poems of his and our recitations might end with our teacher giving her own recitation with the accent always falling correctly, hands clasped, eyes turned heavenward. There was probably a portrait of Pushkin on the wall too. I wanted to become a Pushkin skeptic. There was more than a little of the plaster saint about the man. Then I wrote a book on how Russians imagined the regions and found that Pushkin pretty much created the Russian concept of the provinces and the provincial as female, a few years out of style, and yet somehow more Russian than the capitals. I started work on a new project. I had hopes that the historical figure I was working on was the first Russian to critique American democracy. But no. Pushkin got there first, once again. The man simply will not stay in the box of literature. So when I saw the new play, Pushkin, by Jonathan Leaf, now playing at the Sheen Center for Thought and Culture until August 25, I came aware of both the reverence I should have felt were I Russian and the complex feelings I actually have for him. I found a tightly written and incredibly well acted play that portrayed Pushkin in the last years of his life (1834-37). Pushkin is played by Ian Lassiter, who has a profile exactly like Pushkin’s famous self-portrait. The staging (brilliant, by the way) presents him most often to the audience in profile, so I had plenty of time to marvel at this, as well as a Pushkin that is losing money at gambling, arguing with his friends and wife, and being humiliated by having to wear a low-ranking uniform at court. All the time, I felt I was seeing a flesh-and-blood Pushkin. The play is wise in not trying to convince us that Pushkin is a great poet but rather in simply taking it for granted. His verse in English translation is like a fish out of water, and the audience could only judge from the brilliant but fading scales what it might have been flashing and turning in its native Russian stream. Instead, the play focuses on the human drama, which was abundant in the last years of Pushkin’s life. Sister A, the poet’s wife, (Natalya Pushkina (nee Goncharova, played by Jenny Leona) is flirting with a man who marries Sister B (Katarina, played by Olivia Gilliatt), while Sister C (Alexandra, played by Lexi Lapp), is perhaps too close to the poet herself. The possibility of this being played as farce, while repugnant to contemporary Russians, is not completely absent and was noted at the time. The play treats everyone with compassion and humanity, though. Count (actually should be Baron) D’Anthes (played by Christopher Kelly), the man Russians love to hate, is shown as someone rather empty-headed and handsome who is surprised to find himself actually falling in love with Pushkin’s wife. Natalya, who was the reigning beauty of St. Petersburg but less than universally admired today, is portrayed as being frustrated by her husband’s actions and attracted to the handsome and very attentive D’Anthes. There remains something a bit empty in their relationship, though, and this is likely by design. The two most intense relationships in the play are those between Pushkin and Nicholas I and the poet and Alexandra. Nicholas I, very well played by Gene Gillette, is shown like a meddling, all-powerful father who wants to both control and support Pushkin. Their scenes together seethe with frustrated magnanimity and genius. 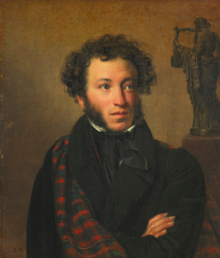 In some ways, the heart of the play is Pushkin’s relationship with his sister-in-law Alexandra, which was the subject of contemporaries’ gossip. The play presents her as a book-loving and thus, inevitably, Pushkin-loving sister who tries to say no. But it isn’t easy saying no to a genius. Out of all this drama emerges the fatal last act of Pushkin’s life. The course of events will not comes as a surprise to Russians or Russianists, but is exciting and terrible as it unfolds. Of course there are some simplifications and omissions. Pushkin and Nicholas I didn’t meet in person as often as they do here. The leadup to the duel has been smoothed out to make it more comprehensible. The death scene has been shortened. (But it is still great). All this is not essential. What is essential is that everyone interested in Russian literature or Russia see this play.